The Dubai International Boat Show is one of the region’s most awaited events of the year. Running on many years of success, DIBS has positioned itself strongly among its peers such as the Monaco Yacht Show and the Miami International Boat Show, attracting both exhibitors and visitors from around the world. Despite a seemingly lower footfall at 2017 show this year, companies have racked up orders and are gearing up for production. 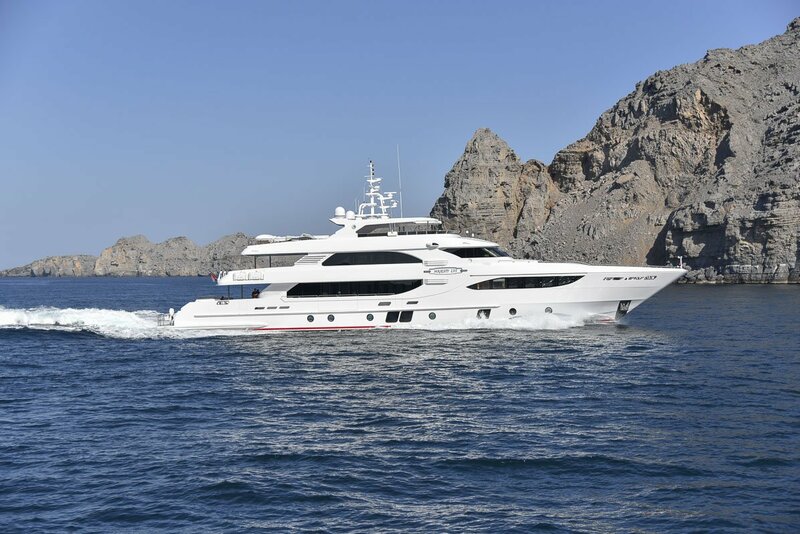 Case in point: UAE-based Gulf Craft; the company received several build orders for its award-winning Majesty 135, as early on as the first day of the show, which was a nice way to celebrate the shipyard’s 35th anniversary. The superyacht has previously won the prestigious Best Asian Built Yacht award at the Asia Pacific Boating Awards and was named a finalist at the 2016 World Superyacht Awards. A tri-deck capable of accommodating up to 16 guests and a crew of 10, it boasts a spacious interior, meticulously crafted with exclusive, high-end materials. The vessel features balconies, a jacuzzi and a variety of “toys” to ensure unforgettable cruising experiences. The Majesty 135 yachts will be delivered in the GCC in Spring 2018. Sailing in style with her Majesty 155! This is definitely the yacht to buy if you plan on sailing luxe style! Another ‘royal’ that stirred admiration is Gulf Craft’s flagship, first displacement superyacht, the Majesty 155. In its first regional showcase, the craft was the company’s largest boat on display, with an overall length of 47m. Her seven vast, lavish suites can comfortably accommodate up to 16 guests. Using the latest technology found in A380 aircrafts, she is easy to handle, stable and quiet, leaving few wakes behind when she sails. the yacht’s sundeck is livened up by an ornate fountain and a tempting waterfall that cascades into the craft’s built-in jacuzzi on the upper deck! And as if that wasn’t cool enough, the vessel has a dedicated beach club and an elevator that carries guests between the lower, main and upper decks! Cloud 9 sets sky-high standards. Historical ship builder and Italian brand CRN brought its bespoke naval art to the Dubai International Boat Show, promoting its heritage and personalized approach to shipbuilding. 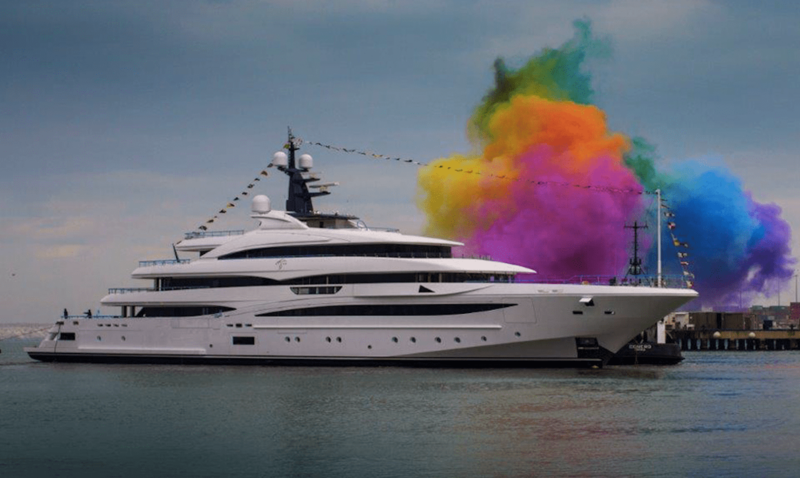 The Ferretti Group company specializing in designing and building truly unique, bespoke yachts, presented its 74m, custom superyacht CLOUD 9, which was just launched in Italy this January. 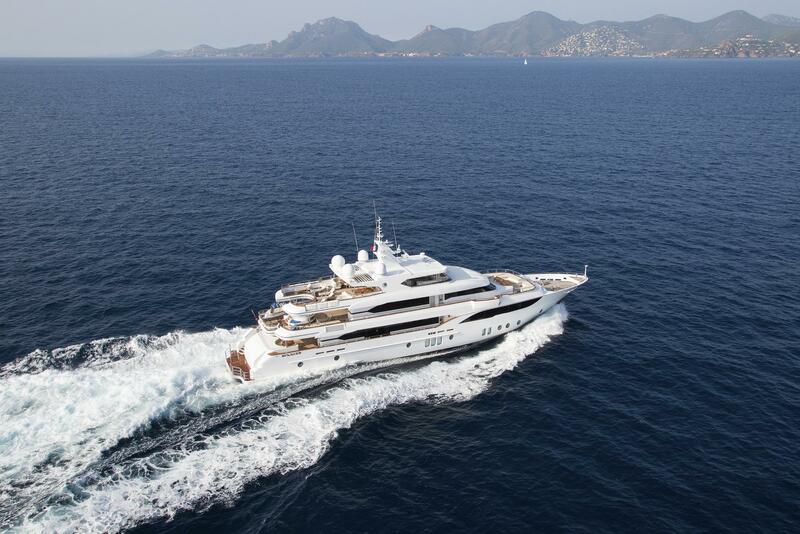 Commissioned by an experienced superyacht owner, CLOUD 9 emerged from a close collaboration between the CRN shipyard, Zuccon International Project (for the exterior design) and Winch Design (for all interior design and decoration). In a superb combination of engineering expertise and ground-breaking design, the boat has over 1,000m² of design elements spanning across all decks, in an optimized balance between interior and exterior spaces. With a beam of 13.50m, five expansive decks including a beach club, and a sub deck, the yacht welcomes up to 16 guests in a master suite, VIP suite and six guest cabins, while a crew of 22 can be comfortably accommodated in 13 cabins. Powered by two Caterpillar 3516C 2,000 kW – @1600rpm engines, the vessel delivers a maximum speed of 16.5 knots and cruises at a speed of 15 knots. The maritime business in the Middle East is definitely growing; the positive interest in boats and early yacht sales at the 25th edition of the Dubai International Boat Show demonstrated that trend, asserting the region as much more than an emerging market. Previous Post Happy 15th, Emirates Airline Dubai Jazz Festival!